Many of the communities we seek to strengthen through philanthropy continue to be systematically disenfranchised, excluded from full access to opportunity and disproportionately affected by inequities related to health, economic security and education. While philanthropy can be a powerful agent for equity and inclusivity, it can also overlook or exacerbate these issues. We believe that philanthropy must be deliberate in working to ensure that its work is fully inclusive of diverse voices, experiences and the concerns of our communities and that the field is disciplined in advancing equity in our policies, practices and institutions. Since early 2013, The Giving Practice has been leading peer learning cohorts of foundation CEOs engaged in advancing diversity, equity and inclusion in their organizations. These peer cohorts are structured to create a space to share successes and challenges in this work, and to facilitate learning from one another through reflection and confidential dialogue. They are geared for both the advanced practitioner, as well as those who are committed but relatively newer to this work. The Giving Practice works collaboratively with the group to design a process that promotes an authentic learning environment. 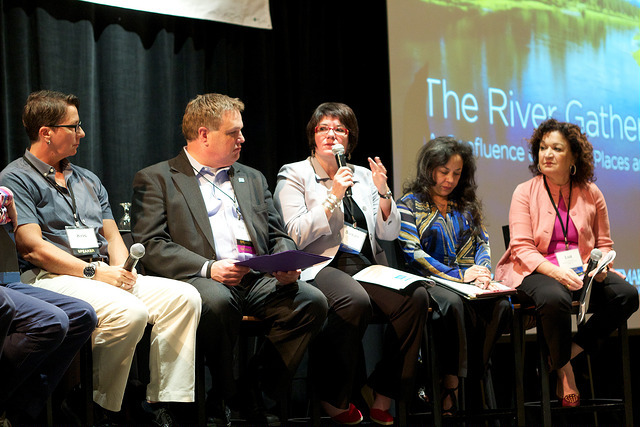 DEI CEO Cohort panel in 2014 (l to r): Kris Hermanns, Max Williams, Susan Anderson, Kelly Brown and Luz Vega-Marquis. In 2017, Philanthropy Northwest is relaunching our Grantmakers of Color Network, a regional community of practice to advance the interests of people of color in philanthropy and address the impact of racial disparity within philanthropic institutions and communities of color in the Pacific Northwest. Bringing together foundation professionals — trustees, program officers, administrative and technical staff — GCN members add a needed perspective to philanthropic discourse and debate. Philanthropy Northwest will be providing opportunities for members to network and learn from peers through in-person events and online through webinar discussions, resource list and a listserv. This new training session is designed on core principles of racial justice. It is constructed to build the capacity of grantmakers and trustees to use a racial equity lens in the design and implementation of grant programs. Through this interactive training participants will deconstruct concepts of race, power, privilege and bias and strengthen their analysis of these challenges in their practice and policies for grantmaking and programming. The session will include perspectives from peers in the field and promising practices from those who have implemented strategies to tackle equity in their Foundations. Our Momentum Fellowship prepares professionals from historically underrepresented communities, particularly communities of color, for successful careers in the philanthropic sector. During the two-year program, each fellow is paired with a regional foundation to develop as well as deepen skills and network opportunities. At the same time, Philanthropy Northwest supports them through a suite of activities, mentorships, and reflective practices to help them navigate their journey of learning and impact. The Fellowship started as an idea that grew out of The Giving Practice’s inaugural 2015 Diversity Equity and Inclusion CEO Cohort. Today, it is a robust pipeline program. Nine talented individuals participated in our first cohort of fellows, and today, five of them are working in full-time positions in philanthropy. In 2017, we commenced our second cohort of amazing fellows in partnership with Empire Health Foundation, Whatcom Community Foundation, Women’s Foundation of Oregon, Marguerite Casey Foundation, Meyer Memorial Trust, and Rasmuson Foundation. We encourage you to reach out to us to learn more about this exciting program, which has been featured in The Chronicle of Philanthropy and The Seattle Times. For insights on our application process, and to hear from the fellows themselves, please see this resource roundup. For a range of resources related to diversity, equity and inclusion in philanthropy, visit our Resource Center.